PUNE, MAHARASHTRA (KP) - In a desperate bid to seek attention Ragi Darshan Sinh, the heretical former Jathedar of Sri Akal Takht Sahib, has now began to question the sacred ‘Bhagat Bani’ enshrined in Sri Guru Granth Sahib Ji, and also questioned certain passages of the daily Sikh ardaas. Disturbingly, Ragi is orchestrating all these attacks against the Sikh Scriptures while under the protection of security guards, and commandos being provided to him by various agencies and anti-Sikh outfits. Ragi Darshan Sinh, who was ex-communicated from the Khalsa Panth in 2010 for challenging Sri Akal Takht Sahib’s authority, was recently invited to Pune, Maharashtra, and Fresno, California by like minded heretics. He has continued to spew venom filled rhetoric against, not only against Sri Dasam Bani, but also questioned the sacred verses of Bhagat Namdev Ji’s Bani, and called the mention of Sri Amritsar Sahib in the daily Sikh Ardaas a monetary based conspiracy. In the above video, Ragi Darshan is purposely mis-interpreting the following sacred verses of Bhagat Nam Dev Ji that are enshrined in Guru Granth Sahib: 'ਨਾਮੇ ਕੇ ਸੁਆਮੀ ਸੀਅ ਬਹੋਰੀ ਲੰਕ ਭਭੀਖਣ ਆਪਿਓ ਹੋ'. Ragi claims that these verses are in praise of the Hindu deity Ram Chandar, and were written when Bhagat Naam Dev Ji was his devotee. He also claims Guru Arjan Dev Ji purposely included these verses to present contrasting views about Nam Dev Ji's devotion to Ram Chandar and later to Akal Purakh Sahib. It is pure blasphemy to suggest that any of the Bani enshrined in Sri Guru Granth Sahib Ji is not Divine "ਧੁਰ ਕੀ ਬਾਣੀ" and praises mortal deities instead of Akal Purakh. Similar statements have been made by other anti-Panthic heretics who did not understand the unified message of Sri Guru Granth Sahib Ji's Bani and Sri Dasam Bani. In the past deviant organizations such as Panch Khalsa Divan (Bhasaurr), Pro-Kala Afghani Pseudo-Missionaries, Rozana Spokesman, and the controversial author Pashaura Singh have also presented similar views about the divinity of Bhagat Bani enshrined in Sri Guru Granth Sahib Ji. Interestingly (Giani) Lal Singh Sangrur, who was associated with the 'Panch Khalsa Divaan' (Bhasaurr) attacked Bhagat Bani in the exact same manner in his controversial book "ਭਗਤਿਮਤਿ ਤੇ ਗੁਰਮਤਿ" that was published in the eartly part of the 20th century. Extract from 'ਭਗਤਿਮਤਿ ਤੇ ਗੁਰਮਤਿ', page 30. Lal Singh Sangrur uses the exact verses as Ragi to reject Bhagat Bani. What Ragi stated in the above Pune video is verbatim what Lal Singh Sangrur stated in his controvercial book. How coincidental is that? 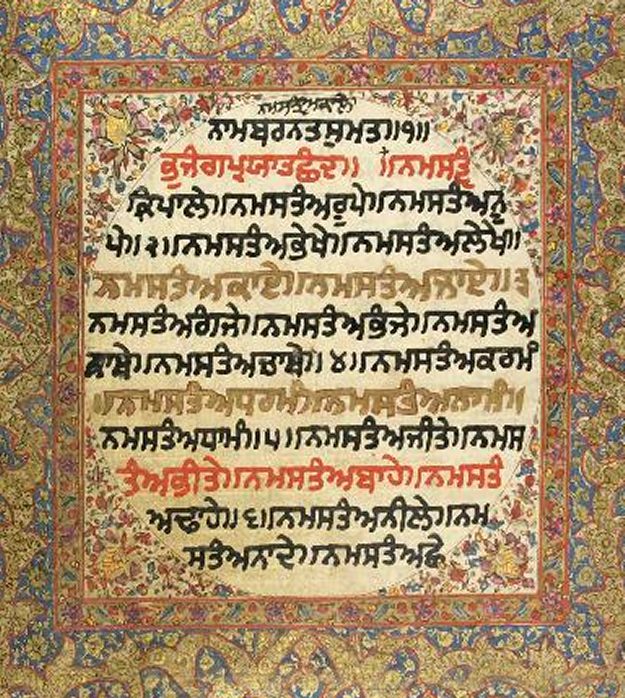 Note the "ਇਕਾ ਬਾਣੀ ਇਕੁ ਗੁਰੁ ਇਕੋ ਸਬਦੁ ਵੀਚਾਰਿ ॥" verse printed on top of Lal Singh's Book this is the same verse continually used by Ragi Darshan and his Kala-Afghani associates. They misuse it in their case against Bhagat Bani, and Sri Dasam Bani. The respected Panthic scholar, grammarian, and historian Prof. Sahib Singh in his monumental work ‘Sri Guru Granth Sahib Darpan’, vehemently rebukes such Bhagat Bani critics. He has written extensively about the Divine unified message in the Bani of the Guru Sahibans, Bhagats, and Bhatts. Prof. Sahib Singh Ji critically chides heretics who question the divinity of Bhagat Bani, and provides substantiates that Bhagat Nam Dev Ji and others Bhagats were devotees of only Akal Purakh Sahib, and not of Ram Chandar, Krishan or other deities. “ਭਗਤ ਬਾਣੀ ਦੇ ਵਿਰੋਧੀ ਸੱਜਣ ਨੇ ਇਸ ਸ਼ਬਦ ਦੀ ਅਖ਼ੀਰਲੀ ਤੁਕ ਦਾ ਹਵਾਲਾ ਦੇ ਕੇ ਲਿਖਿਆ ਹੈ ਕਿ ਭਗਤ ਨਾਮਦੇਵ ਜੀ ਕਿਸੇ ਸਮੇ ਸ੍ਰੀ ਰਾਮ ਚੰਦਰ ਜੀ ਦੇ ਉਪਾਸ਼ਕ ਸਨ। ਪਰ ਇਸ ਤੋਂ ਪਹਿਲੀ ਤੁਕ ਵਿਰੋਧੀ ਸੱਜਣ ਨੇ ਪੜ੍ਹੀ ਨਹੀਂ ਜਾਪਦੀ, ਜਿਸ ਵਿਚ ‘ਧ੍ਰੂ ਥਾਪਿਓ ਹੋ’ ਲਿਖਿਆ ਹੋਇਆ ਹੈ। ਧ੍ਰੂ ਭਗਤ ਸ੍ਰੀ ਰਾਮ ਚੰਦਰ ਜੀ ਤੋਂ ਪਹਿਲੇ ਜੁਗ ਵਿਚ ਹੋ ਚੁਕਾ ਸੀ। ਜਿਸ ‘ਬੇਢੀ’ ਦੇ ਗੁਣ ਨਾਮਦੇਵ ਜੀ ਪੜੋਸਣ ਨੂੰ ਦੱਸ ਰਹੇ ਹਨ ‘ਰਹਾਉ’ ਦੀਆਂ ਤੁਕਾਂ ਵਿਚ, ਉਸ ਬਾਰੇ ਆਖਦੇ ਹਨ "ਬੇਢੀ ਰਹਿਓ ਸਮਾਈ"। ਸੋ ਨਾਮਦੇਵ ਜੀ ਸਰਬ ਵਿਆਪਕ ਦੇ ਉਪਾਸ਼ਕ ਸਨ। "
It is clear from other verses of Bhagat Ji, that he was a devotee of only Akal Purakh and not of any deity. "ਨਾਮਦੇਵ ਦਾ ਮਾਲਕ ਪਰਮਾਤਮਾ ਹਰੇਕ ਜੀਵ ਦੇ ਅੰਦਰ ਦੀ ਜਾਣਨ ਵਾਲਾ ਹੈ, ਤੇ ਸਾਰੇ ਦੇਸਾਂ ਵਿਚ ਵਿਆਪਕ ਹੈ"
In the above video, Ragi is suggesting that the phrase "ਸ੍ਰੀ ਅੰਮ੍ਰਿਤਸਰ ਸਾਹਿਬ ਜੀ ਦੇ ਦਰਸ਼ਨ ਇਸ਼ਨਾਨ" in the Sikh Ardaas was based on a conspiracy by Sri Darbar Sahib authorities for the collection of money and prestige. This offending suggestion by Ragi shows exactly how much respect this heretic has for the sacred Sri Dabar Sahib Amritsar, that dear to all Sikhs worldwide, and the great Sikh personalities from Gurdwara Reform Movement. Being in the RSS heartland, and given protection by Hindu commandos in Pune, the Ragi tried to instigate the local Hindu emotions against Sri Guru Gobind Singh Ji's Bani. Why? Because there are passages in 'KrishnaAvtaar' that state Krishna and Arjuna had consumed intoxicants. In the video, Ragi repeatedly pleads to the Hindus in the local sangat and patronizes them as his "Hindu Veer". "It is obvious that heretic Ragi Darshan is intentionally trying to provoke the situation, even ignoring the facts that the consumption of intoxicants by Krishna and Arjuna is also mentioned in the Hindu Granth, Mahabharata itself, and not just Sri Dasam Granth Sahib." "Liquors were of two sorts Soma and Sura...Soma was a sacrificial wine. The drinking of the Soma was in the beginning permitted only to Brahmins, Kshatriyas and Vaishyas... Sura was open to all and was drunk by all. The Mahabharat mentions an occasion when both Krishna and Arjuna were dead drunk." It is clear that Guru Gobind Singh Ji's Bani is simply revealing the truth about these Hindu Avtaars - obviously this is something that can not be fathomed by this heretical Ragi. There are other verses in Sri Guru Granth Sahib Ji and Sri Dasam Granth that highlight the inadequacies of these previous avtaars. Would Ragi Darshan be willing to the join the RSS and his "Hindu Veer" in condemning these verses? In actuality, Ragi already has. In the Jujar Veda, Kaan Krishan of the Yaadva tribe seduced Chandraavali by force. He (Akal Purakh) created millions of insects like Krishna. He destroyed many Rams and then produced them again. Likewise there have been many incarnations of Ramchandar and Krishan. Directly in-line with the Kala-Afghani ideology, Ragi is stating that Sri Hemkunt Sahib has no connection to Sri Guru Gobind Singh Ji, yet in an older video scene from the movie Nimmo, he is repeatedly referring to Sri Hemkunt Sahib as the 'ਤਪ ਅਸਥਾਨ' of Dushat-Daman Guru Gobind Singh Ji. In these movie scenes he is promoting Sri Hemkunt Sahib and seen continously flapping his arms 'Bollywood' style while partaking yatra through the snow clad Himalayan hillsides on his way to 'Sapt Shring' peak. In the above video, Ragi directly insults Sri Guru Gobind Singh Ji's Bani by suggesting that five-hundered 'blue movies' could be made from the same sacred Sikh Scriptures that were scribed by Baba Deep Singh Ji, and Bhai Mani Singh Ji, and recited by the Khalsa Panth. It needs to be noted that Ragi, who has publicly questioned not just the validity of Sri Dasam Granth, but also the sacred Banis of Amrit-Sanchar, the daily Nitnem, and claims that the word “Bhagauti” in the Sikh Ardaas is a salutation to the Hindu deity Durga, has now set targets on holiest of holy Sikh scriptures, Sri Guru Granth Sahib Ji, and the venerable Sikh Shrine of Sri Darbar Sahib, Amritsar. Perhaps the most disturbing aspect of Rag Darshan’s vitriolic propaganda is that it is being instigated from Sikh funded institutions and Gurdwaras. Various directives from Sri Akal Takht Sahib clearly forbid Sikh institutions and Gurdwaras from providing a platform for this ex-communicated heretic. In reaction to his February 2011 Pune visit, and the vile remarks made by Ragi from local Gurdwara stages, the local Sangat has requested Sri Akal Takht Sahib to take strict action against those who have hosted the Ragi, and allowed the Sikh sangat funded Gurdwara stages to be misused for anti-Panthic purposes. Ragi travelled in Pune with an entourage of government provided security guard ‘commandos’ who encircled his every move from airport to the local Gurdwara Sahib. After his Pune trip, the Ragi visited rural central California in the first week of March 2011. Against Sri Akal Takht Sahib directives, several publicly funded Sikh Gurdwaras were misused to host Ragi’s vile mis-parchar. Sadly, the management of these Gurdwaras barred everyone except Ragi’s supporters from entering the Gurdwara premises during his visit. These heavy handed tactics were enforced with the help of local police authorities and utilizing private security guards who ensured no one except pro-Ragi supporters entered the Gurdwara premises. Sikh activists from the local Fresno Sangat have formally requested Sri Akal Takht Sahib to take strict action against the management of those Gurdwara committees who violated Sri Akal Takht Sahib's directives and allowed the heretic Ragi to misuse the Sangat funded platforms of these institutions for anti-Sikh mis-parchar. The local Sangat who raised concerns about Ragi’s visits was not allowed into any of these Gurdwaras during Ragi’s visit - this is a clear violation of the Sikh Rahit Maryada. These so called Missionaries and Kala Afgani people misleaded the people that they preach same as Prof Sahib Singh, Giani Ditt Singh and Bhai kahan Singh Nabha. But they are no where near to those personalities. Like you did in this news/article, please always compare these communist's thoughts with Prof Sahib Singh's and other such Gurmukhs. So sangat can be aware of such people's propaganda against bani and how they misuse panthic personalities name to preach their lies. Darshanmal your Countdown has began!!!!!!!!!! no.. he is SICK of his mind. bas is tarahaan da ik banda hi kaafi hunda hai..
DASAM Granth sahib di aatmik dunghai nu wichaaran nu chad k...........Aapni Bakwaas maari jaanda hai. Bas karo prof sahab !!! People used you, to preach all this, doesnt support you any more.